Runecast has just released a major release of their flagship product – Runecast Analyzer 2.0, which brings some interesting new functions and features. One of them is the ability to show all previous scans of all detected and resolved issues on a historical view which allows the admin to isolate events which have happened after configuration changes or a patch update. The whole UI has a completely new, modern and redesigned look too. Every new release has some new features added. The previous releases have added VMware vSAN, NSX-V support (v1.8), and the support for vSphere 6.7. We don’t have that information, but we imagine even more VMware products supported in the future releases so VMware admins will be able to have all the best practice, performance and compliance information within the single pane of glass. Runecast provides VMware knowledge base articles, best practices, and security hardening recommendations that are constantly updated and centralized, and present them within the dashboard showing you whether your environment has issues or not. Know that a large majority of incidents could be avoided if you have had the right information about the problem within the right moment before the incident happens. 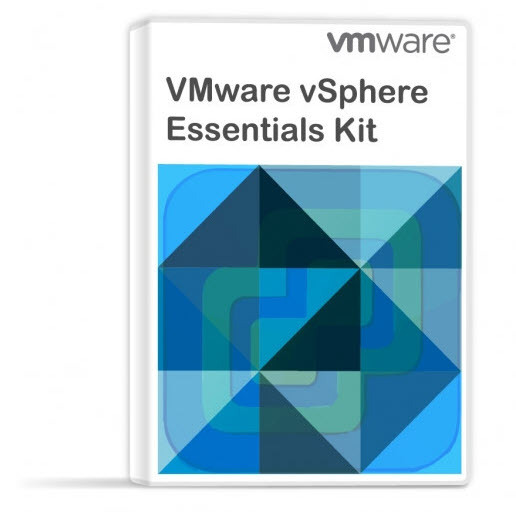 It is a very innovative product which points you to the parts of your vSphere infrastructure which is not compliant with the latest VMware KB articles and might be an issue causing downtime or lead to bad performance. It checks your vCenter, ESXi, VMs for many different points and compares that state with up to date VMware KB articles. What’s New in Runecast Analyzer 2.0? We had a little time to play with the RC release. You might already be tested before, but the Installation and configuration of Runecast are simple. You need to download the OVA and deploy it within your environment. Within Runecast you simply add your vCenter(s) servers and run the initial scan. 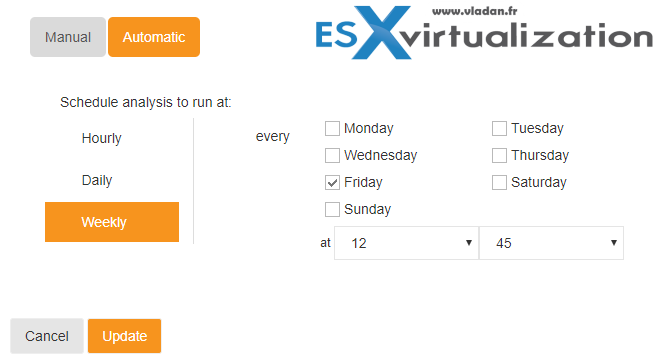 Further, you can configure scheduled scans, email notifications or log integration where your ESXi are automatically configured to send logs to Runecast Analyzer for being processed and integrated into the dashboard view. Here is the overview of the whole new UI from my lab. (note the “Issue history” is empty because after an installation in my lab environment there were not enough historical scans just yet). This new function is able to analyze the environment on a timely basis and present a history of what’s new as issues or configuration changes. Like this, the admin can view if he (she) installed for example a security patch or an upgrade, what was the effect on the environment. To see, if there were new issues detected or disappeared after the patch. And for the individual widgets, you can see something like this, for example, for Best-practice adoption. Here is another screenshot from Runecast which can show you the daily scan detection change and the interactive chart. 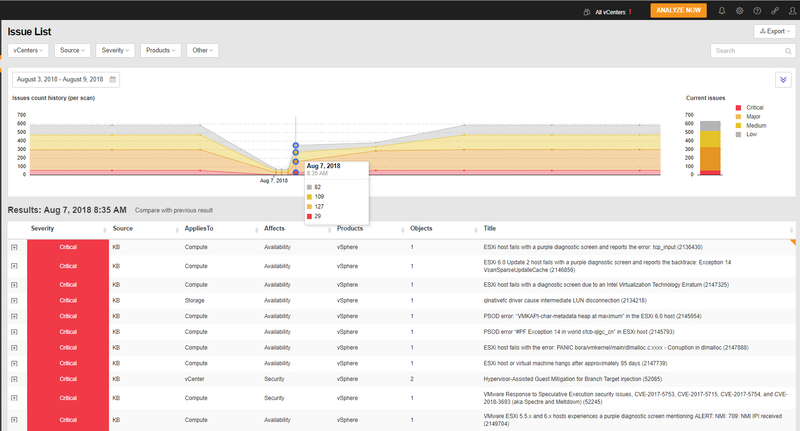 As you can imagine, to track changes which have a direct impact on your security, best practices or configuration of your environment, has become easier with Runecast Analyzer 2.0. You have the results of scans and the interactive time chart. You can click a button which compares with previous results giving you only what’s changed since that scan. Dots on the chart areas are interactive and upon a mouse click, show issues and details from that particular scan in the table below. The chart supports zoom-in/out and mouse drag for easier navigation in selected time-range. And this is not all. It presents the delta of changes in a view where the admin can see only what’s new as issues. and this “changelog” has issues list where you can click on the details in each section. This function allows staying compliant with Payment Card Industry Data Security Standard (PCI-DSS). Usually, financial institutions, banks, and exchanges need this. It’s quite complex apparently on what needs to be checked on the VMware side, but the institutions which should comply with this standard needs to make sure that they are compliant. You can enable the PCI-DSS compliance within the Runecast Analyzer Settings. Runecast Analyzer is able to detect those specific issues and provide help to VMware administrators to fix those problems. As Runecast analyzer now supports vSAN, NSX-V or vSphere, each of those products can be filtered. Useful when you searching only for vSAN related issues for example. Here is the essential what you need, just after installation. If you’re already a customer, please note that Runecast can provide you with an offline ISO. Yes, in fact, for high secure installation without Internet access Runecast provides an ISO file with all the necessary updates, which is available on the user profile page. In Automatic mode, you can set the scanning and analysis frequency and can also use the ‘Analyze now’ button to manually start the scan. It is recommended to enable and configure automated scheduled scans. One of the previous releases has added also a VMware vSAN support. As you might know, there is now over 160000 VMware vSAN customers so the hyper-converged solution from VMware is getting more and more traction. 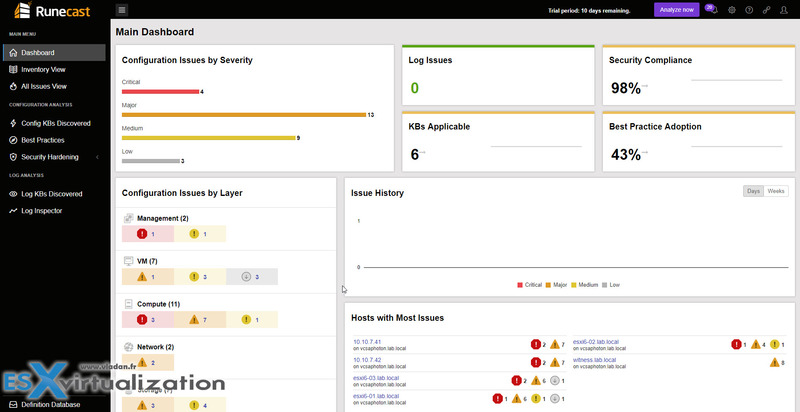 The product detects issues related to vSAN, NSX or vSphere. For example, for vSAN, It can be problems from the hardware perspective (number of disks not equal, RAM not equal) or software perspective (firmware, drivers). Runecast scans vSAN clusters and tests their configurations against a large database of VMware Knowledge Base and Best Practice rules. Things which you as an admin would not be able to do manually. The full-featured trial has all the functions of the product. The product works with VMware vSphere 5.x and 6.0, 6.5 and 6.7. Licensing is per physical socket based on a yearly subscription. Check out Runecast Analyzer. You can download 30 Days Trial from Runecast website.